Starbucks released the Mocha Cookie Crumble Frappuccino last summer and when summer came to an end so did the roll out of the Cookie Crumble Frappuccino, within the UK at least. It has returned again this summer and we guess this will be a cycle Starbucks will apply to this particular drink annually. 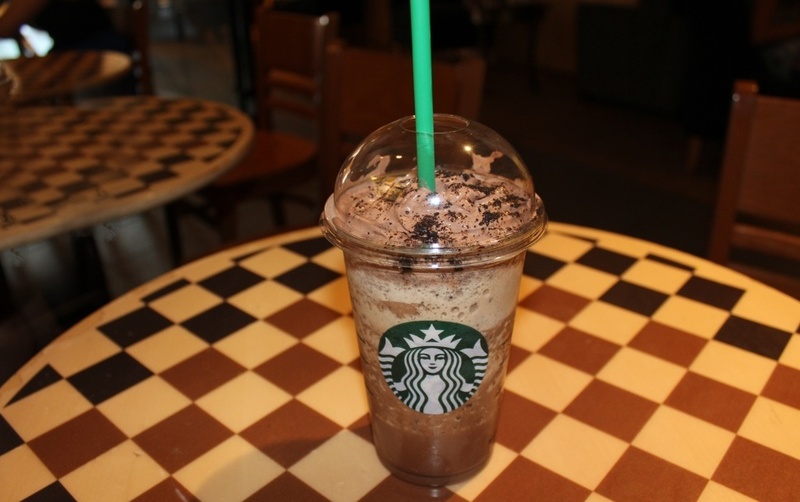 Regardless, the Mocha Cookie Crumble Frappuccino is well worth a sip within its limited availability time slot. It distinguishes itself from the rest of the Frappuccino crowd by being served with chocolate flavoured whipped cream and cookie crumb pieces on top, which you can request not be added if you wish. Usually Frappucinos are served with standard unflavoured whipped cream, so this is a refreshing change and is deviously sweet and all-round tasty too. The drink's appearance is a dark milk chocolate brown and combined with its topping it produces a mouthwatering presence. According to the Starbucks official website the drink's recipe of ingredients consists of mocha sauce, vanilla syrup and chocolate flavoured chips which are all blended with coffee, milk and ice. For those concerned about fat content, calories and nutritional value, Frappuccinos can always be made with soya milk, skimmed milk, semi skimmed milk and whole milk. And they’re all available in Tall 12oz (small), Grande 16oz (medium), Venti 20oz (large), Trente 30oz (extra large). But we could distinctly taste cookie crumbs within the drink, so we think that cookies are also blended into the equation too or the cookie crumbs on the whipped cream sink into the drink? The cookies used appear to be Oreo-styled and are therefore rather tasty. We wouldn't know how to make the Starbucks Mocha Cookie Crumble Frappuccino exactly, but we have had a few attempts of replicating the drink at our studio and the results have come very close to the real thing. Essentially the Starbucks Mocha Cookie Crumble Frappuccino is a spin on the classic Starbucks Mocha Frappuccino, with even more chocolate. Chocolate enthusiasts should find this an obvious 'go-to' drink on the Starbucks cold menu and, despite options which can reduce fat content and calories, this is in no way a healthy drink even with the greatest of nutritional reductions applied. Onto its taste; this is an intensified Mocha Frappuccino at its core. The chocolate chips really enhance the already well established chocolate aroma, the flavour of which tastes like a high quality and severely rich chocolate milkshake. The thick and creamy texture lends well to the flavour. The coffee flavour is subtlety underlying and as you can probably already tell the balance of chocolate and coffee sways firmly in the chocolate direction. Initially we couldn't get enough of the sweet cookie crumble flavour, but midway through a Venti sized portion we did begin to feel a tad overwhelmed. That’s not to say that it is a bad drink, it tastes luscious and also packs a refreshing punch. In terms of the pick me up effect given from the Starbucks Mocha Cookie Crumble Frappuccino we were unsure as to whether we were experiencing an erratic sugar rush or caffeine high, or possibly a combination of the two. But whatever it was we felt alert straight after consuming this Frappuccino. Overall this is a deviously chocolatey cold drink from the Starbucks menu. As it can definitely be overwhelming if too much is consumed we'd recommend sticking with a Tall or Grande size, but it's well worth a try this summer.